The Maple Leaf is 40 years old. Middle aged. I was just a young sprout of six when we traded the Union Jack for the Maple Leaf. I remember something of the conflict. I remember being aghast that the parents of a neighbourhood buddy of mine were divided: Tommy's mom was in favour of the new flag while his dad was against. At six years of age I had never heard of a mom and dad disagreeing on something as major as the flag! 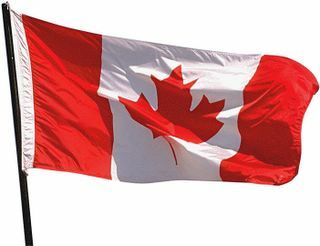 What I don't like about the flag is that it is only red and white -- clearly Liberal Party of Canada colours. You can tell which party was in power 40 years ago. Oh well -- a liberal flag for a liberal country.